The first desk used by Charles Dickens when he was an article clerk in the law offices of Ellis and Blackmore, Holborn Court, London in 1827. 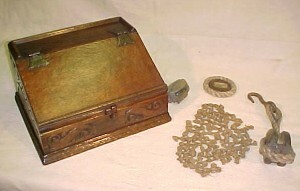 The novelist George Eliot’s small, revolving, burr walnut writing table from her house in London in 1858 bearing a brass plate with its provenance. 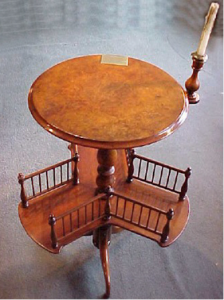 Also a Georgian mahogany dining table that belonged to the Poet Laureate, Alfred Lord Tennyson, purchased in 2012, in an auction of items from his residence Farringford on The Isle of Wight and the writing desk used by the famous thriller writer Sir Frederick Forsythe. At The Dorking Desk Shop we are constantly searching for unusual or unique items. Thanks to our extensive personal contacts with all major auction houses we are often able to source pieces with an interesting provenance and history. If interested we are happy to advise when pieces of this calibre become available.